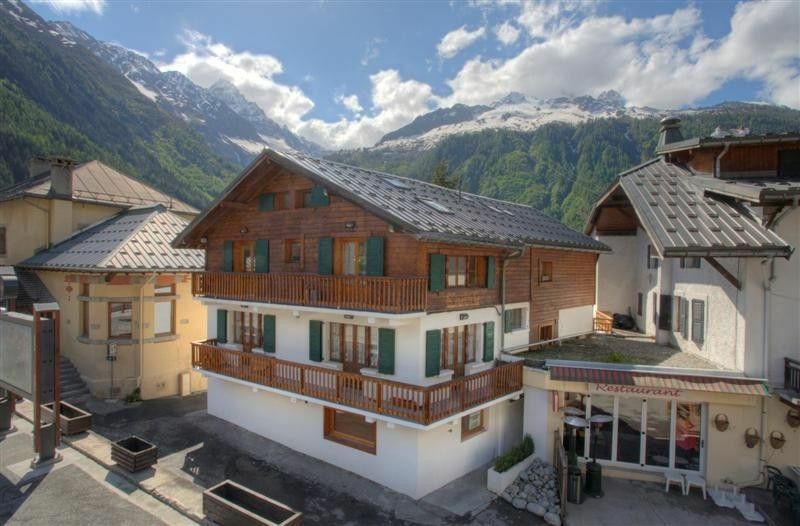 A beautifully furnished, duplex, holiday apartment in Chamonix with three bedrooms and two bathrooms on the second and third floors of the village old library. The Old library is in the centre of Argentiere village, next to the Office du Tourisme. The supermarket is 100m away and bars and restaurants close by make this a super convenient holiday location. The two doubles and a twin room are serviced by two separate bathrooms: one with a shower, the other with a massage bath and shower. The property has a balcony that looks out over the main road and village square allowing you to watch village life go by whilst you relax after a day on the slopes. A large TV screen with Apple Mac computer, Wii and BOSE sound system make up the extensive multimedia entertainment system. The nearest ski lift is Grand Montets, which is 500m away and easily accessible by the free ski bus or on foot. Mont Blanc Retreats is a British Rental agency specialising in high quality chalets and apartments in the Mont Blanc region. A larger selection of our properties is found on our website. The Old Library's central position in Argentiere village means your holiday needn't just be about the skiing. The convenience of shops, bars and restaurants right outside the front door mean this property is one of our most heavily booked, especially in winter. Add in luxurious leather sofas, a high-tech media centre, two bathrooms, three bedrooms and a ski locker and the Old Library is a wonderful place to spend a holiday in the Chamonix valley. Mont Blanc Retreats also arrange airport transfer and in valley transport. In winter: ski/snowboard hire and lessons. In summer: climbing tuition and guides, paragliding, rafting, kayaking, ascents of Mont Blanc and even helicopter rides. Contact info@montblanc-retreats.com for bookings and more information. Bathroom one has a whirlpool bath. Both have heated towel rails. The lounge does have a sofa bed but the accommodation is limited to six people. We thoroughly enjoyed our stay at the Old Library. Argentiere and the surrounding area is absolutely beautiful! The apartment was well equipped with everything we needed and convenient for groceries, a fabulous bakery, restaurants and nearby sights. We could not get movies to work on the TV, but were not really concerned as we did not come to Argentiere to watch TV. Booking, payment, check-in, check-out and return of our damage deposit was fast and simple. We would not hesitate to stay at the Old Library again. Would recommend to others. The kitchen needs a microwave oven and we never figured out how to turn on TV but these were minor issues. Lovely apartment in the heart of Argentiere. Convenient for the slopes and the village and got everything that you need. This is the second year that we have stayed here which says it all!! The property was as described in the listing. It was clean and well maintained, although the upstairs shower had a poor flow of water. We found the property very comfortable and was ideally located in the centre of the village, within walking distance of shops, bars and restaurants. Mont Blanc Retreats provided excellent customer service. This area of the Alps is beautiful and there was plenty to do during the summer. We purchased a 5 day (non-consecutive) mont blanc pass and this was excellent value for money, we would highly recommend paying the extra for the mont blanc panoramic gondola ride into Italy, which was the highlight of our trip. Argentiere is 10 minutes by car to the Alpine town of Chamonix Mont Blanc. It sits at the base of one of the best ski areas in the region, the Grands Montets and is only 5 minutes from La Balme ski area. The Grands Montets is the highest ski domaine in the region, at 3300m at the top station! It is a heaven with skiers and boarders alike. Switzerland and Italy are both close by. The infamous Vallee Blanche ski run which descends 17km from the top of the Aiguille du Midi to Chamonix is accessed by the Aiguilee de Midi lift just 10 minutes away. The summer has plenty to offer with walking, hiking and mountaineering on your door step as well as paragliding, rock climbing, white water rafting and mountain biking.